Super Mario Galaxy 2 is the most unnecessary Mario game of all time. That might be why it is one of the best. Galaxy 2 has an easy mission, because, for once, it is a Mario game without a big mission. It is not launching a new gaming console, as did Super Mario Bros., Super Mario World and Super Mario 64. It is not trying to prove greatness can be at last succeeded, as the long-awaited Super Mario Sunshine had to do in the shadow of '64. It doesn't have to prove that weird concepts like spherical levels or baby Mario or four-player Mario can carry a Nintendo action-adventure to sunny heights. It doesn't even have to satiate Mario-starved fans, because those fans are probably still plump with the last big Mario adventure, which was released not six years ago but six months ago. It doesn't have to help its home platform become a hit, because the Wii already is one. Super Mario Galaxy 2, simply put, doesn't need to exist, save for cash-in and for kicks. It is a return to the bombastic Mario play of 2007's Super Mario Galaxy, a cosmos of fun ideas and level design that sent Mario skipping around planets and leaping from moon to moon with an orchestra booming behind him. That game was fun. This game is more of that, more Mario on spherical worlds, with Yoshi the dinosaur, new powers and — less prominently advertised — some 2D levels. Not really more of the same. No. This feels like Nintendo let themselves mod a great one into a greater one. This is better than the same. By the way, Bowser kidnaps Princess Peach and Mario has to rescue her. Super Mario Dirt, Super Mario Water, Super Mario Gravity: The first Super Mario Galaxy let players jump through a little more than 40 galaxies, of which 30 core ones offered as many as five quests apiece. The quests always involved obtaining a star by jumping through surreal obstacle courses and maybe defeating a giant villainous plant or beast through some clever hitting of weak spots. The new game's levels have the same basic design but there are more of them — at least 49 — with fewer star quests on each and more imagination throughout. As with the first, a variety of gameplay styles are offered, offering the player challenges that range from traditional jumping courses to flying races to using tilts of the Wii remote to make Mario drive a rolling ball across elevated floating platforms. But most of the controls are traditional and non motion-based, while most of the levels feel fresh. There are levels that set Mario on floating planets or more familiar, flatter levels using both classic themes or ones which I've never seen in a Mario game before. But equally winning are those that riff on themes introduced in Super Mario 64, Super Mario Sunshine and the Galaxy team's brilliant pre-Galaxy game, Donkey Kong Jungle Beat. All of Galaxy 2's worlds are new (except… well.. you don't want me to tell you). The best levels involve some combination of the game's three strongest elements: 1) Dirt, through which the game's best new power-up allows Mario to bore, spinning him from one side of the planet to whatever is on the other side; 2) Water, which is the main element of the Sunshine-riffing Starshine Beach, a rare Mario level that's more of a Zelda puzzle about what to do next than a bunch of leaps for survival; and 3) Gravity, over which the gods of Galaxy routinely exert mischievously shifty control. A Visible Visual Dream: Super Mario Galaxy 2's designers and artists will not make you jump through anything that could exist where you live or in any so-called realistic game. Nah. You'll swim through floating jelly, clamber over pop-up tombstones and hang-glide past columns of lava as you visit world upon world that make the fantasies of the first game feel flat. Level Design With An Attitude: The Super Mario Galaxy 2 designers know you've played Mario. And they probably know that you know that they know. Assassin's Creed II creative director Patrice Desilets was on to something when he described video games as a dialogue between player and designer. Early in your romp around the planets and galaxies of Super Mario Galaxy 2, you will find that Nintendo is talking to you. They know you don't expect this planet to be hollow and full of coins or that level to suddenly flip on its side. You are playing their game while they are playing you. That's the spirit of this sequel, which feels like a Mario made for the Mario veterans. People who only play Wii Sports will have a delightful time in the first of the game's six main world maps, but I doubt they'll reach the first Bowser boss battle, let alone get all the gameplay jokes and handle all the gameplay twists. The Drill and The Cloud Suit: Let there be no future Mario games that exclude Galaxy 2's option to have Mario pick up a drill, spin it into the ground, and come out the other side unscratched. And let's have more Cloud Suit, a power-up that enables Mario to generate three puffy white floating platforms with successive spin jumps. It also lets the man walk on clouds. These are Mario Galaxy 2's best new powers out of the handful of new upgrades dropped into various levels. Fat Trimmed: Galaxy 2 may seem like the luxurious Mario we didn't need, but it is not flabby. The hub space station of the first Galaxy has been replaced with a moderately interesting floating Mario head of a level. This Mario "spaceship" is used less as a playground than, when zoomed out, as a cursor that can travel across the game's map and be used to select which galaxy to play in next. Less time is wasted accessing maps in this new game and more time is spent in action. Sure, a lot of Galaxy 1's enemies repeat and the shake-the-remote fireball-throwing power that returns in Galaxy 2 is still as unintuitive and imprecise. But this game at least moves with more zip than the last. Having more levels and more variety among them helps too as the content feels less stretched and more solid. Yoshi: Mario's green dinosaur was an empowering delight when he was intruded in 1990's Super Mario World. He could absorb an extra hit, eat fruit and spit enemies. His playable debut in a three-dimensional game, Super Mario Sunshine, was a compromised disappointment. The dino couldn't even survive getting dunked in the sea, a problem in a game full of water starring a character who is known to be a great swimmer. Galaxy 2 brings the empowering Yoshi back with his flutter-jump, his ability to absorb an extra hit, and, best, the one new bit of Wii-centric control in the new game: a point-and-click interface that lets gamers mark enemies for consumption with their Wii Remote cursor and then have Yoshi gobble them with his tongue. If only more Galaxy 2 levels had the green guy. Enticing Secrets: The secrets are good in this game, well-hidden and rewarding to discover. Galaxies have hidden prizes that lead to new galaxies. Secret areas contain secret areas. There's stuff with Luigi that the instruction manual spoils but I won't. There are ghost runs of a sort that you'll figure out. This Mario game is made for your microscope and your lateral thinking. The Booming Soundtrack: Some gamers will love the soundtrack, the fully-orchestrated pieces that reference old Mario games or sound new melodies. But the music is too often grandiose and it made me feel like I was always playing the game during the opening or end credits of a feature film, the music constantly at a swell. Galaxy 2 sounds big, too often. This splinter of the Mario world may be Nintendo at its most Bruckheimer and Bay, but even a buoyant guy like Mario needs a softer mood to calm things from time to time. Lubba: The new help systems in Super Mario Galaxy include little in-game TVs that will, optionally, show pre-recorded gameplay tips. They also include the Cosmic Guide, which will allow the player to cede control of the game to the Wii. The latter is only available after a player's Mario dies a lot. Using it doles out an inferior reward, incentivizing human-guided playthroughs. Galaxy 2 also includes the returning co-star mode, which allows a second player to use just a Wii Remote to collect items and, this time, zap enemies. All that is fine. But Lubba, the captain of the starship Mario who frequently suggests that you take a break from playing Super Mario Galaxy 2, is not. He will recommend a rest to a triumphant Mario and to a defeated one. He is as much the unwelcome presence of the do-your-homework-now paternal side of Nintendo as is this game's little banker character who offers to hold the star gems you collect in the game so that they can accrue interest the longer you leave them be. The Wiggle Room: Nintendo was right to let people who made Donkey Kong Jungle Beat, an inspired side-scroller on the GameCube, include side-scrolling levels in Super Mario Galaxy 2. They are high quality. But they also may be the first — certainly the best — 2D levels ever presented in a Mario game that also includes 3D levels. That inclusion exposes the problem with 3D Mario: Under even the skilled hands of Nintendo's top creators, a Mario that can move in three dimensions, rather than two, will always be less reliable to control and more prone to imprecise player input. The 2D design in Galaxy is welcome, but it also is a reminder that some of the 3D stuff in this game and the other 3D Marios is tougher because, well, 3D Mario level design is less tight than 2D design. By definition, 3D levels must include an extra dimension. That dimension is an extra variable that allows error, player confusion and frustration. The 2D levels prove to be a reminder that, ok, maybe 3D levels are never going to be as sublime as those in 2D. The world did not need another Super Mario game already. But if that is what freed the designers of Super Mario Galaxy 2 to run wilder with their imagination, then let's have more unnecessary Mario games. This new one is tougher, more fantastic, more devious, and more varied. It may, at times, be too bombastic and too impressed with its own difficulty, but those are slight faults. It is a joyful jungle gym with something different at every leap. It's a happy game designed to make you curse, but also designed well enough to make you try and try again. It showcases Mario in some of his best 3D and 2D missions to date. 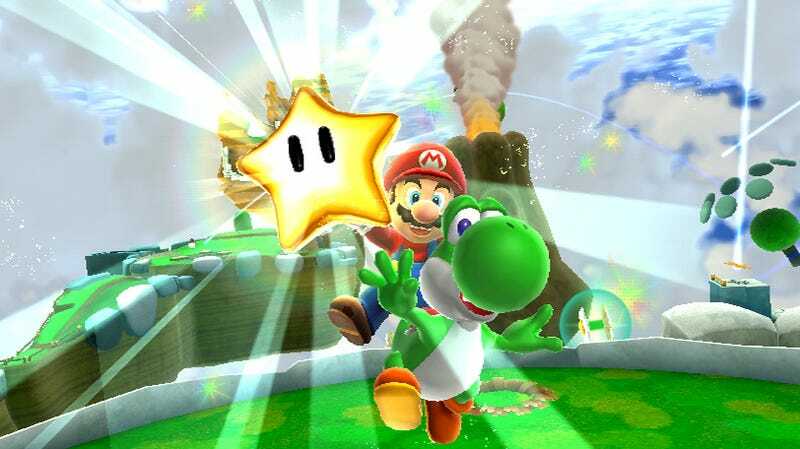 Super Mario Galaxy 2 was developed and published by Nintendo or the Wii on May 23. Retails for $49.99 USD. A copy of the game was given to us by the publisher for reviewing purposes. Played through the main campaign, collecting four more than the required 70 stars required for narrative completion. Endeavoring to collect more, given some of the treats tucked in the game map, but worried my skills are meeting their match some 30 stars earlier than they did with the first Galaxy.